Koolasuchus was not a crocodile, but an enormous amphibian, related to the modern day salamander. Today’s Giant Salamanders of Japan and China are huge by most standards (about 5 feet long), but that’s only about one-third the size of this massive Koolasuchus. Koolasuchus was named for paleontologist, Lesley Kool. Koolasuchus is also an appropriate pun on the word “cool” in reference to the relatively cool climate in which it existed – Southern Australia was below the Antarctic circle during that time. This large aquatic predator lived mostly in fast-moving streams of water, but was also capable of crawling onto land. It would feed on fish, crustaceans, small animals, and scavenged carcasses. 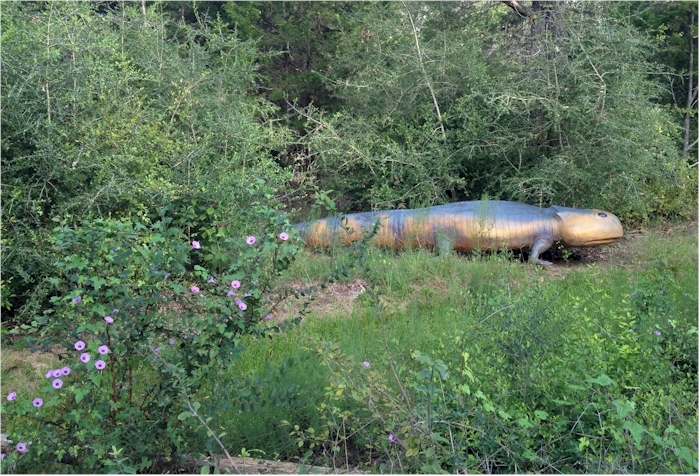 Koolasuchus had a lifestyle similar to that of a crocodile, although crocs did not exist in this particular habitat until years later when the temperature of the landscape increased.